Growth of the surveillance state has produced a worldwide movement of fraught people who claimed they are being stalked, or gaslighted, 24/7. Read all about one Australian man’s claim. In the liberties and rights business, you hear from ‘nutters’** quite a lot. For the past two years I’ve had emails from a chap in Perth who says he is being systematically stalked by surveillance people at all hours, and harassed on the phone, day and night, including having his sleep consistently disturbed. How am I to know, across a continent, whether what he says is true, or if he is a ‘nutter’? If true, what can a civil liberties campaigner do about it? There could be real people invading his privacy, but we have little criminal law protection against anyone doing so surreptitiously, without physical contact, and no tort of privacy to be able to sue someone civilly, even if you can identify them. For either type of remedy, you have to convince a court of law, based on evidence, usually via the police. But how are police to nab people only you can see and hear? As for hard and fast proof, people are usually unable to provide any, to me or to real, live police officers, or to politicians or ombudsmen or any of the dozens of people and bodies frequently approached by the stalked to try to find someone to do something about “it”. How do you prove you’ve heard voices at night that no-one else does? How do you photograph people outside your home in the dark when neighbours don’t see anyone or anything? How do you record sounds only you hear? One day, just recently, I responded to the Perth man for the fifth time and suggested he seek psych help to deal with the perception of being surveilled, or stalked. 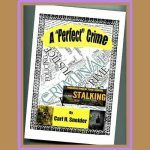 Whether or not he is being stalked, the issue is preying on his mind: he perceives it is happening, and maybe a psych could help him deal with the perception, real or not, I suggested. The cross-continent suggestion, of course, went down like a lead balloon trying to fly against the wind from east to west across Australia. Lo and behold, the very next day, unbidden and unexpected, through the mail came a book about the very same issues written by man who lives not more than 20km from me on the east of the continent. Mr Sneider gives what he calls “A First-Person, Victim’s Report on Organised Groups Stalking in Australia”. “multiple offenders and squads of offenders and rotations of squads of offenders even within the same night, or weekly, or monthly or during the year”. Now, I’m inclined to be a bit sceptical about all this attention on one “innocent” man, which Mr Sneider says he is: I’ve seen quoted that it costs the AFP and/or ASIO about $2m a year to mount round-the-clock surveillance on one Australian citizen, so anyone under real surveillance by our spooks would have to be a fairly high-priority target. and microwave and radar scanners which can see inside the Sneider house. “…my neighbours are unaware of anything like aggravated organised group stalking is happening in our neighbourhood. So, there are no supporting ‘eyeball witnesses’ to the criminal activity, or sightings of perpetrators.”. I could go on and on with a retelling of Mr Sneider’s claims: he does, for another 240 pages, which include about 150 pages of diary entries. “..due to the near impossibility of proving precisely who, amongst the numerous offenders operating in teams, and rotations of squads, and use of advanced stand-off electronic warfare devices, is the person in violation of…statutes proscribing stalking, death threats, and threats of grievous bodily harm”. “nearly impossible or impracticable to prove who precisely the perpetrators are that it amounts to what is widely accepted as a ‘Perfect’, or unsolvable crime”. The most interesting bit, though, is where he describes a trip back to the USA to visit his dying father in 2003. He admits to being “naive”. Oh, and by the way, he started an argument with a TSA female operator at the airport; once in the USA, he headed for his booked reservation in a motel in Las Vegas that just happened – unknown to him – to be holding a convention of Muslims. It appears that Mr Sneider believes the TSA airport woman “flagged” him on the US border watch list. Or maybe he got on a “to be watched” list because he wrote emails back home about the cheap little car he hired, calling it the “bomblet”…as one might, if trained in the Aussie lingo. A massive expansion of an online community battling what they call “gang-stalking” has occurred in recent years, with the spread of thousands of websites, videos and organized events for followers of the movement. Those who believe “gang stalkers” exist publicly and brazenly express their concerns that there is a systematic form of electronic and physical pursuit of “targeted individuals” being conducted by government and corporate entities. …and that was before mobile phones, copious e-devices and spookware bloomed***. 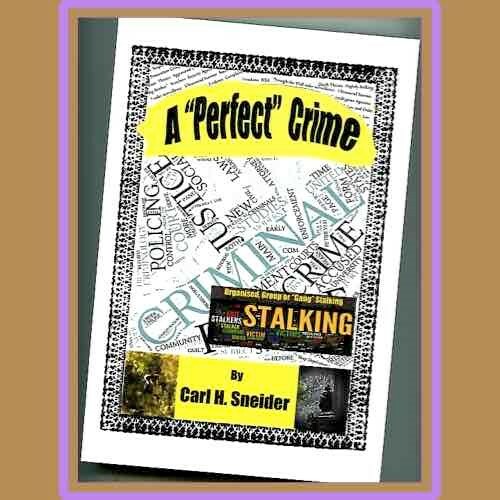 DETAILS: ’A “Perfect “ Crime’ is published in paperback and ebook editions by xlibris.com Bloomington IN USA. It’s available at Angusrobertson.com.au ($44.99), bookworld.com.au, bookdepository.com.au, fishpond.com.au etc. Indian police have detained a pigeon that flew into a village near the heavily militarised border with Pakistan on suspicion it was being used for espionage. They say they’ve X-rayed the bird after a villager spotted a stamp under its feathers that bore Urdu script and the name of a Pakistani district. ** Nutter: a crazy or strange person (not a ‘politically correct’ term). To that definition I would add that, in the fields of law, civil liberties and human rights, a person prone to writing copious volumes of never-ending text in which there may be the seed of a genuine complaint, but the kernel gets lost in the wordstack. * Bill Rowlings is CEO of Civil Liberties Australia. This neighbourhood [EASTWOOD-MEADOWBANK] has ongoing gang stalking activity(a.k.a organised stalking). Predatory Gangstalking is a criminal phenomenon referring to a group of loosely affiliated people who, in an organized and systematic manner, relentlessly invade all areas of an individual’s life on a continuing basis. Often stalking is done for vengeance to silence potential whistle-blowers. Tactics of Predatory Gangstalking include highly coordinated surveillance (hidden cameras, conversation bugging in private aswell as public), harassment, and psychological, social, financial, and sometimes physical assaults on an individual by a large group of people who are often strangers to the targeted individual. A Predatory Gangstalking group is a well-run organization comprised of members who are unidentified as gangstalkers to the outside world. Until a group of gangstalkers turn their face towards someone selected to be one of their targets, members of society do not realize there is such an invisible group. Perpetrators who organise gang stalking are associated with private security intelligence firms, criminal organisations. Tactics include threats and abusive comments in public, breaking into the victim’s residence, slandering (lying about the victim), harassment by noise, getting people to follow the victim wherever they go and copying their body language to let them know they are being stalked, criminal invasion of the victim’s privacy e.g by tapping phone lines, getting a snitch to infiltrate the victim’s house and hacking computers (the crime of eavesdropping), and other serious violations of federal and state law. Let’s bring awareness to the local Ryde-Eastwood community together. If you are a victim, you are not alone. Spread the word to all your family and friends to make sure they don’t get targeted or recruited for this program to harrass people in our neighbourhood. Time to fight back together. If that’s your opinion about gang stalking, then you’re a travesty of a human rights movement. You’re serving only the liberties of the Mafia. It will be said like that in public.